Scanning the shelves at your local video store for something to watch this weekend? As the official day for summer approaches, why not try one of these summer themed films to help enhance the anticipation and kick off the celebration. Summer is a great time for movies that are entertaining, light, fluffy, fun, and do not necessarily require a lot of thought. After spending a hot sunny day at the beach, watching movies on Blu-ray/DVD can be a nice way to relax and keep cool from the summer heat. I’ve listed my all time favorite summer themed movies below. Sorry, suntan lotion not included. At Ocean Front High, what do they call a guy who cuts classes, hates homework, and lives for summer vacations? A teacher. Mr. Freddy Shoop, a high-school gym teacher, is forced to cancel is summer plans to teach a "bonehead" English class for misfit goof-off students. Will his unconventional brand of teaching connect with them? A When your Dad's an undertaker, your Mom's in heaven, and your Grandma's got a screw loose...it's good to have a friend who understands you. Even if he is a boy. Vada Sultenfuss is obsessed with death. Her mother is dead, and her father runs a funeral parlor. She is also in love with her English teacher, and joins a poetry class over the summer just to impress him. Thomas J., her best friend, is "allergic to everything", and sticks with Vada despite her hangups. When Vada's father hires Shelly, a makeup expert, in his funeral parlor, and begins to fall in love with her, Vada is outraged and does everything in her power to split them up. 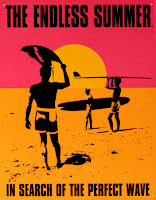 A landmark documentary, and the first serious look at surfing and those who devote their lives to it, The Endless Summer is a tribute to sun, surf, and freedom. Toting their boards from one spectacular coastline to another, Bruce "Big Kahuna" Brown and his accomplices, professional wave riders Robert August and Michael Hynson, pursue the summer season around the world in their quest for that ever-elusive perfect ride. Favorite Quote: "If I could only have one food for the rest of the my life? That's easy... Pez." The adventure of a lifetime, the summer of their dreams...the dog of their nightmares. Nice list you have there! I love the top spot. Seen that movie 85...oh 125 times. Now I just hope the cops don't find all those missing thieves! I also love any old Elvis movie for a bit of summer fever. In that movie "Yes, I can see dead people" do they also scream in Asian?